I just returned from a culinary adventure in rural Tuscany in Italy and came home with many recipes to try at home and to share on my blog. Heather Jarman of Sapori e Saperi Adventures was our guide, and she took my family and me to the Italian countryside, way off the beaten path in the Garfagnana region. We stayed about an hour outside of Lucca. Heather took us to small family farms and introduced us to artisan food producers who learned their craft from their ancestors. It was interesting to learn how foods like honey, olive oil, cheese, and wine are made. Everything is made in small batches with passion and care. 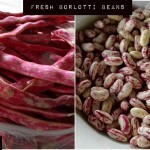 The result is high-quality, fresh, natural ingredients with the most incredible flavors. We watched the food go from field to table, literally. Then we enjoyed home-cooked meals with locals. All the dishes were exceedingly fresh, simple, and divine. Local, fresh, sustainable food is a way of life. Many of the people in the countryside live off their land and have their own vegetable garden and fruit trees to supply food for their own family. Being a city girl, I found this way of life fascinating and so different from the life I know. This area of Tuscany is filled with small hillside villages where generations of families have lived for hundreds of years. The villages are small so everyone knows each other. Our driver Andrea explained the sense of security and safety he feels in his village. He knows he can knock on any door and get help with anything. We got a sense of that hospitality when Heather introduced us to many locals who were friendly and welcoming. People were open to sharing their craft, to sharing recipes, and to letting us join in the local merriment. Overall, the people seemed to enjoy a slower-paced life marked with good food and good company. One local that I enjoyed meeting was Michela. She had a crafts booth at the Farro Festival we attended high up in the hills of the Garfagnana. 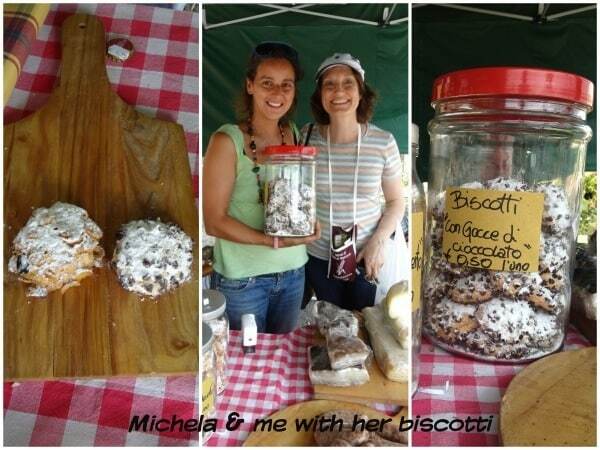 Michela was selling homemade soap and biscotti (translation = cookies). She shared the booth with a friend who sold homemade salumi and other charcuterie. The whole group was very friendly and wanted to chat. Michela explained how she made natural soap from the by-products of pressing olive oil. She infused her soaps with herbs and flowers like rosemary and lavender. 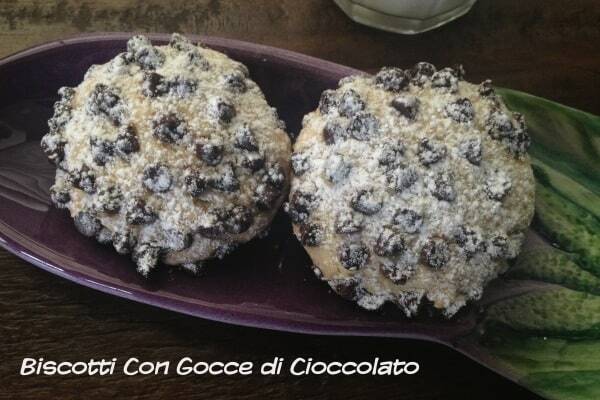 My kids and I fell in love with Michela’s “biscotti con gocce di cioccolato”– little round cookies with a crumbly texture speckled with bittersweet mini chocolate chips. These biscotti were not the hard, long cookies found at American coffee houses. This cookie recipe comes from Michela’s grandmother, and Michela was generous enough to give the recipe to me. She quickly scribbled a few simple ingredients in Italian on to the back of her business card. She verbally gave Heather the directions in Italian, and basically said, “mix it all together.” This was one of many friendly encounters we had with locals. And one of many recipes that I collected along the way. 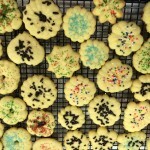 When we got home from our Italy trip, my kids were excited to test out Michela’s cookie recipe. With such cursory instructions, I didn’t know if the recipe would turn out. I tried to get more guidance from online Italian baking blogs, but nothing really helped. As a side note, Google Translate is great for interpreting a recipe in a foreign language. So I just kept the faith and went for the recipe with the proportions as given. I did add a little salt and vanilla to the recipe. As I went along, I translated the weight measurements into cup measurements for American bakers. I had no procedure to follow, so I mixed the ingredients in the order of other cookie recipes that I had made before. Very quickly I had the most delectable little cookies. The recipe is perfect as is. The crumbly, soft, slightly dry cookie base is a wonderful vehicle for decadent chocolate, so be sure to use a good-quality dark chocolate. Some friends helped with cookie sampling, and the cookies disappeared fast. Thank you to Michela and her grandmother for sharing their Italian tradition with us. Preheat oven to 350 degrees F (175 degrees C), and place rack in the middle of the oven. Put softened butter and sugar in a large bowl and mix together well with a wooden spoon. Add beaten eggs and vanilla and incorporate completely with the spoon. In a separate bowl, stir the dry ingredients together: flour, baking powder, and salt. Add half of the dry mix to the wet batter and stir a little. Add the rest of the dry mix and incorporate completely. 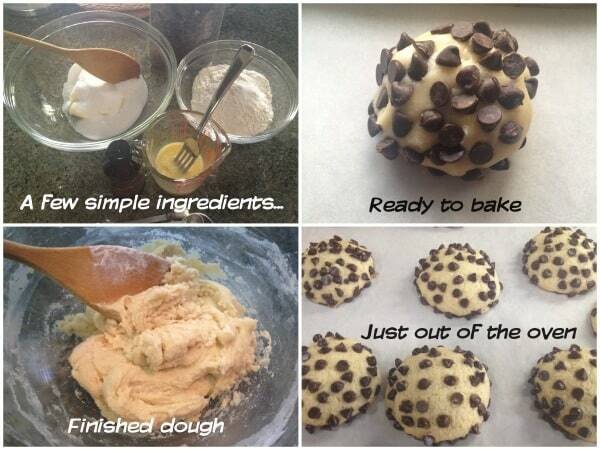 Place the mini chocolate chips on a plate. Roll a small spoonful of batter into a 1 to 1-1/4 inch ball. Then roll the dough ball in the chips coating the sides and top of the ball well with chips, making sure that the bottom doesn't have too many chips. The dough is soft, slightly sticky, but still firm enough to roll. Place the balls on a baking sheet lined with parchment. Leave room for the cookies to spread just a little. 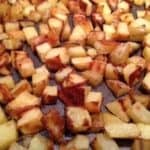 Bake for about 17 minutes or until the bottoms are light golden brown; the tops stay pale-colored. Slide the whole sheet of parchment on to a cooling rack. Don't touch until the chips cool and firm up. 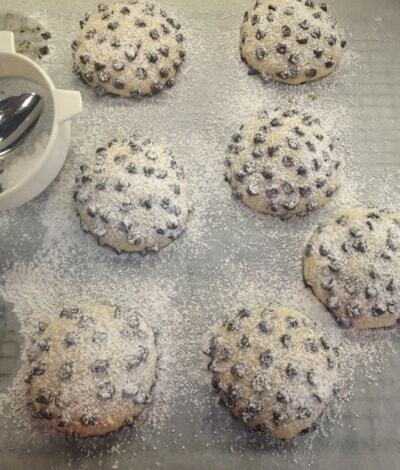 When cool, dust with powdered sugar. PS: Stay tuned for more Italian recipes to come. Don’t miss a single one; subscribe to my blog to be notified by email about a new post. Enter your email in the top right of this page, then look for an email in your inbox and confirm. Ciao! I tried these cookies before Christmas, just to make sure I could get them right. They’re easy and delicious and now I wonder why we spend so much for them in a pastry store lol. They really don’t take much to bake, but I think I have to cut down the size I don’t get as many as you do. Anyway, thank you for this great recipe. Now it’s time for me to bake. Hi Dana. I found my way here via a comment you left on my friend Dan Fogarty’s Instagram post. You know how that internet rabbit hole is! Anyway, I found my way to these biscotti cookies and loved the story behind them. I can’t wait to make them!!! 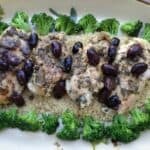 Thanks again for this great recipe!! 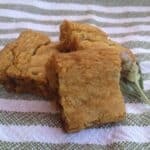 I made these cookies/biscotti they are very good crumbly cookie. We are all crazy about them here. Thanks for sharing. So glad to hear. Thanks for letting me know. Enjoy! Love this site! more cookie recipes PLEASE!!!!!!!!!!!!!!!!!!!!! Thanks for stopping by to let me know. I have many new recipes in the works, so stay tuned. Hi Michele- thanks for being a supportive reader. Hope to see you soon. Dana, your biscotti were perfecto! Thanks for sharing your culinary adventures with us. Hi Nancy- thank you for stopping by and checking out what I’ve been up to. Great to see you again last weekend. These cookies tasted just as good as they look in your photos…can’t wait to see what other treats you’ll be sharing. Hi Sharon- nice to see you yesterday. Glad you enjoyed the cookies! As someone who grew up eating “nonna’s” cookies, your post brings back good memories. My dad and I enjoyed getting to know you and your family and driving you around while in Italy. Andrea- thank you for your lovely comment and for visiting my blog. It was a pleasure to spend time with both you and your dad. 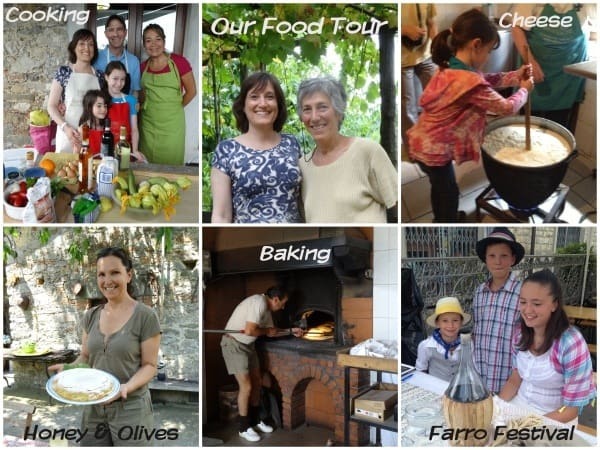 I hope my stories and recipes do a good job of representing life in the Garfagnana/Lucca region. They look wonderful! I can’t wait to make them. Yes, I plan on it. Looks like we’re going to have a nice selection of desserts to go with our grilling! Italy seems to be the place to go this year. Wonderful post. Can’t wait for more of your adventures…and recipes. Judy- likewise. Thanks for stopping by to check out my post. Looking forward to seeing you Saturday and to enjoying your dessert as well.